I really don’t know what to make of this episode. At times it was silly, but not necessarily in a good way, at times it was dark, but kind of hokey. I don’t really find that the Doctor’s behaviour is really believable. 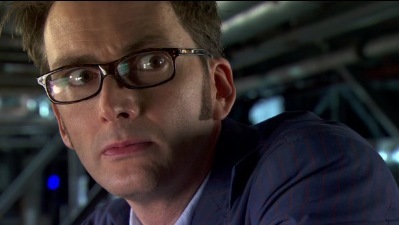 David Tennant’s Doctor is not the Doctor to presume such might over lower-beings (ie. Humans), I could see Christopher Eccelston’s Doctor in that stance, but not Tennant’s. Also, what’s with the burning fire on the surface of Mars? Yes, Mars has atmosphere, but I doubt it’s thick enough to support a burning flame. Though, I did really enjoy the episode.